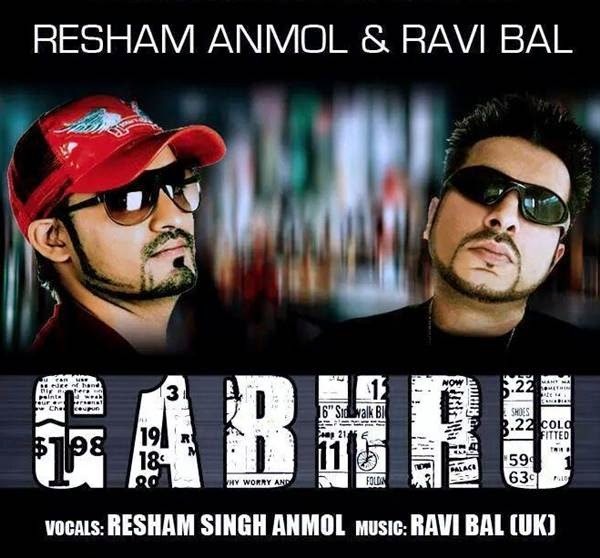 Well known Punjabi Vocal Artist Resham Singh Anmol is coming with a brand new single track titled 'Gabhru' in collaboration with famous UK Based Music Producer Ravi Bal from their Upcoming Music Album. Resham Singh Anmol has learnt singing from Legendary Folk Singer RIP Ustad Kuldeep Singh Manak Ji. He debuted in Industry with widely acknowledged album 'The Beginning' along with Yo Yo Honey Singh back in 2009. His 2nd album 'Dil Mangdi (2012)' was a great success in the music of Maestros Gurmeet Singh and DJ Sanj. Previous Album of Resham 'Addiction 172' was also much appreciated by audience. Music of Album was made by various music producers including Tigerstyle, Kaos Productions, 13db and DJ Vishal. Resham has also done 4 single track so far - Propose, Kangna, Nagni and Kaida. Ravi Bal is the mentor of our loving music producer Bhinda Aujla, who is known for his world famous projects 'Headliner' and 'Headliner 2' with Surjit Khan. We're expecting for something different and big from their first collaboration, hope they won't disappoint us. Muzicmag is an entertainment platform serving Punjabi Music Industry since 2012 with Latest info about music and movie releases. We provide Movie Reviews, Interviews, Songs Lyrics and whatever is related to Pollywood and Bollywood. © 2019 MuzicMag Pvt. Ltd.